In the fictional Star Trek universe, a tricorder is a multifunction handheld device used for sensor scanning, data analysis, and recording data. Three primary variants of the tricorder are issued in Star Trek's Starfleet. The standard tricorder is a general-purpose device used primarily to scout unfamiliar areas, make detailed examination of living things, and record and review technical data. The medical tricorder is used by doctors to help diagnose diseases and collect bodily information about a patient; the key difference between this and a standard tricorder is a detachable hand-held high-resolution scanner stored in a compartment of the tricorder when not in use. The engineering tricorder is fine-tuned for starship engineering purposes. There are also many other lesser-used varieties of special use tricorders. 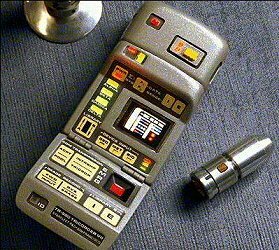 The word "tricorder" is a portmanteau of "tri-" and "recorder", referring to the device's three default scanning functions: GEO (geological), MET (meteorological), and BIO (biological). DARPA's (Defense Advanced Research Projects Agency) Virtual Tricorder program will develop technologies for analyzing and assimilating massive datasets collected on individual test subjects to visualize, understand, and assess health status by modeling and simulating biological systems. The resulting application will enable medical practitioners to visualize and understand complex relationships across patient data in electronic medical record systems. Not only will this technique allow physicians to visualize patients' health status more accurately, but it will also provide tools to predict the systemic impact (positive and negative) of pharmaceutical and other therapeutic interventions on the patient. Achieving this will require modeling the complex, multi-feature, multi-scale interactions in biological systems from the holistic perspective of systems biology rather than the traditional reductionist perspective. Virtual Tricorder will combine multiple physical/biological models to create the capability to realistically simulate numerous simultaneous physical/biological phenomena. Virtual Tricorder technology will have potential applicability in both time-critical medical settings such as a military intensive care unit (ICU) and also long-term recovery settings where patients are being treated for multiple comorbid conditions with multiple therapeutic approaches. - Conceptualize modeling and simulation techniques for biological systems. - Develop techniques for registration and fusion of multi-modal medical imagery (PET/MRI/CAT/sonogram). - Develop techniques for modeling physiological impact of medications and other therapeutic interventions. - Initiate development of visualization techniques that scale from the tissue to the organ to the whole-body.